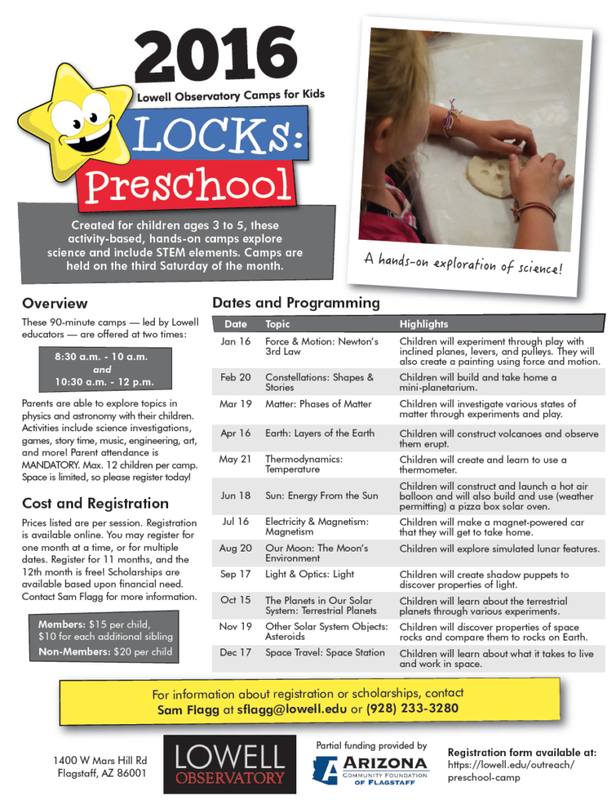 Scholarships are available for those who demonstrate financial need for the 2016 Lowell Observatory Camps for Kids (LOCKS: Preschool). Created for children ages 3 to 5, these activity-based, hands-on camps explore science and include STEM elements. Camps are held on the third Saturday of the month. Parents are able to explore topics in physics and astronomy with their children. Activities include science investigations, games, story time, music, engineering, art, and more! Parent attendance is MANDATORY. Max. 12 children per camp. Space is limited, so please register today! Prices listed are per session. You may register for one month at a time, or for multiple dates. Register for 11 months, and the 12th month is free! Payment is due at the time of registration. Scholarships are available based upon financial need. Contact Sam Flagg at (928) 233-3280 for more information.